If all the radiators in your house are cold or lukewarm, you probably have a larger issue with your heating system. If your downstairs radiators are heating up fine but your upstairs radiators aren’t then your heating system may not be operating at a high enough pressure. If your radiator is cold in places and has leaking water, then you should turn the heat off and tighten the nut on your radiator’s inlet/intake valve. If you don’t identify any of the above issues, then proceed with bleeding the radiator. You should make sure that your radiator is switched off as an active heating system can just produce more air into the system. Allow time for the radiator to settle and cool before bleeding and releasing the trapped air. Lay some rags or bowl underneath the radiator to catch any leaking water. A small amount of discoloured water can escape once the bleed valve is opened, so it’s best to be prepared. Search for a small valve at the top of one end of your radiator. This bleed valve will have a small square end which can be turned with a radiator key for adjusting. Radiator keys are metal instruments used for opening and closing radiator valves. They come in varying sizes, depending on the size and shape of your valve. 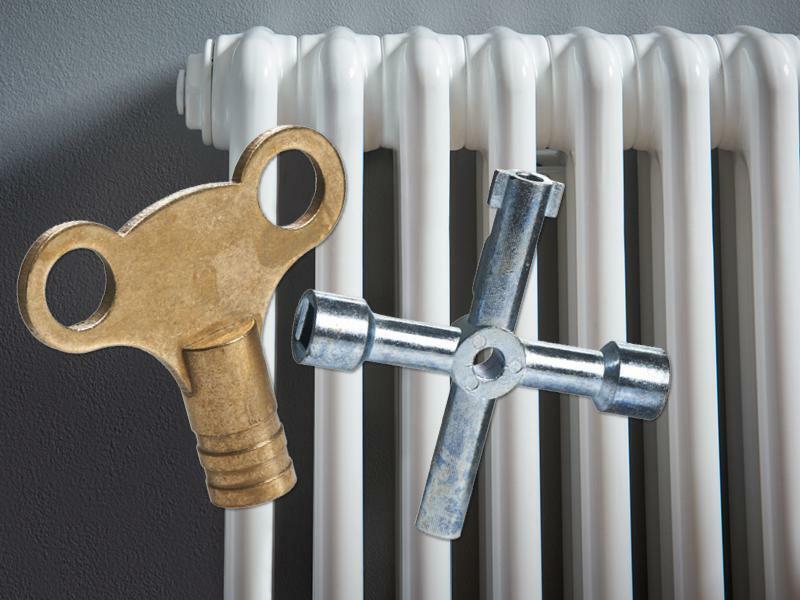 You’ll find our selection of radiator keys here. First make sure the exit and intake valves are turned to the open position. You’ll find the intake valve at one end of the radiator at floor level. At the opposite end, again at floor level, you’ll find the exit valve. Next, insert your radiator key into the bleed valve at the top of the radiator. Turn the screw counter-clockwise to open the valve. You should hear a hissing sound as air escapes from your radiator. This is cold air escaping. Small amounts of sputtering water will escape. Once the sputtering water has stopped, a steady stream of water will squirt through the valve. This indicates that all the trapped air has been released. Re-tighten the bleed valve by turning the radiator key clockwise. Even if you’ve only been having problems with one radiator, it’s best to bleed all your radiators to make sure all excess air has been let out of your heating system. If problems persist then contact a professional. To maintain an efficient heating system, you should try bleeding your radiators regularly. Once a year should be fine. You should also bleed them after any repairs or modifications to your heating system. We hope this guide on how to bleed your radiators brings the warmth back into your life.